« Heads-up! First Win8 Critical Security Updates A’Comin! If you’ve been reading this blog for any length of time, you already know that Lenovo has been updating its PC and notebook drivers and software for Windows 8, surely but steadily, since the March-April timeframe of this year. Just recently, I downloaded their latest version of the ThinkVantage Power Manager software (version 3.00.0006) which represented itself on the download page as ready for Windows 7 and Vista but made no mention of Windows 8. Having had pretty good luck getting 7 stuff to work with 8, I decided to give it a try anyway. It installed without errors or warnings, but lacks any reporting on or coverage of the battery installed in that machine (see photo). This oddly-shaped battery provides a handle for the convertible tablet/notebook X220 Tablet. This was very interesting, because the battery appeared to be working just fine but simply invisible to the Power Manager (and by extension, to LSC as well). I could see and access it using the built-in Power Options item in Control Panel, and a quick download and test of my favorite third-party battery manager — namely, Battery Bar (and its even better commercial sibling, Battery Bar Pro) — showed that the battery was indeed present, and seemed to be doing its job well enough. I’m not wild about the battery life for the X220 Tablet’s stock battery — the 63Wh 42T4879 model only delivers about 2-3 hours of life under normal usage — so I decided to call support, share this information with them, and see what would happen. It took me about half an hour to get on the phone with a support technician after initial dial-in. I explained the situation to her as clearly and concisely as I could, and she said that she would research the matter and someone would call me back “soon.” That was on Friday morning (November 9). This morning, the UPS guy rang my doorbell and presented me with a box containing –surprise! — a replacement battery for the X220 Tablet. I can only assume the company decided to replace the battery because of the LSC diagnostic (bogus, IMO) about which I reported to them. 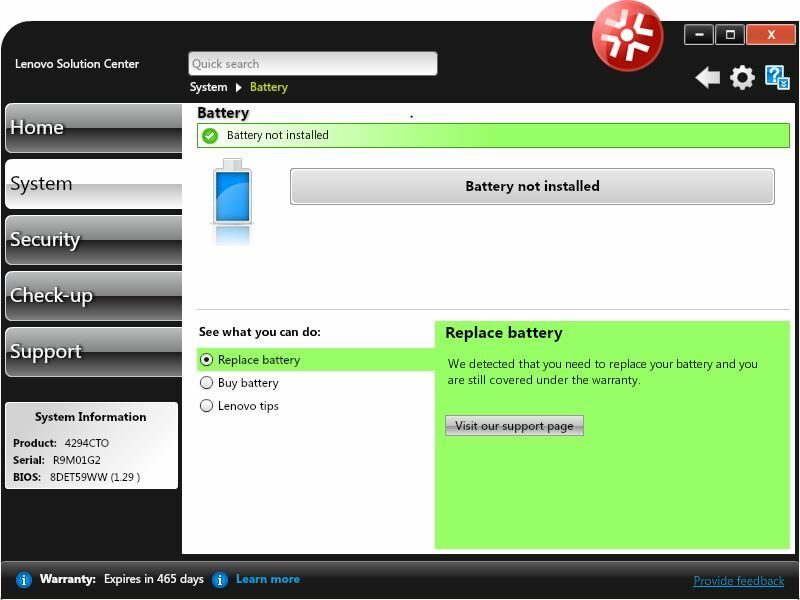 Lenovo may end up eating costs for a lot of X220 Tablet batteries, if all those who own these machines and upgrade to Windows 8 do as I have done, and call in to report the LSC status and wind up with a free replacement. The cheapest price I can find for that part number is $42, not to mention costs involved in shipping and handling a replacement unit via UPS Next Day Air (I’m guessing this cost Lenovo at least $60, perhaps more). But wow! What a way to “update status” on a request for help with immediate delivery of a replacement. You cannot at all fault Lenovo (or IBM Support, which handled my phone call for Lenovo) for slow, faulty, or non-responsive customer service. Without a doubt, this is the very best warranty replacement service I have ever received from any vendor of computing gear, in all the years I’ve been in the industry. Amazing!